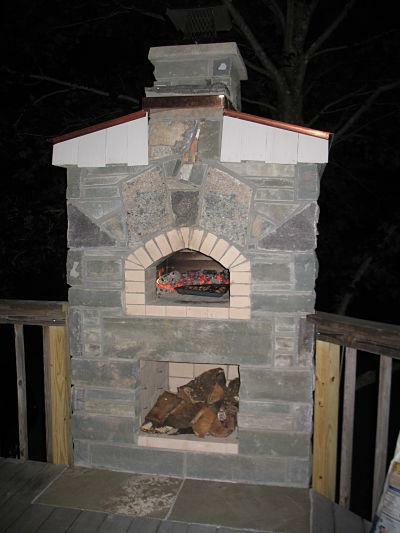 Stone Tower of Pizza Oven Cooks to Perfection. Deck level elevation, showing oven, firebox and facade. They say there is another tower of Pizza in Italy, but it leans badly and it doesn’t even come close to cooking as good a pizza as this fourteen foot tall free standing, outdoor pizza oven. A technical achievement, this high functioning pizza oven is constructed over a concrete core, insulated and lined with brick. The exterior local stone veneer is full of delightful and subtle surprises – – it is a pleasure just to sit in front of, any time of year, and watch the fire burn. Designed and constructed by David Knox of Cassella Construction, in Red Hook, New York. Backside of the oven “tower”, built up to serve a second level deck. 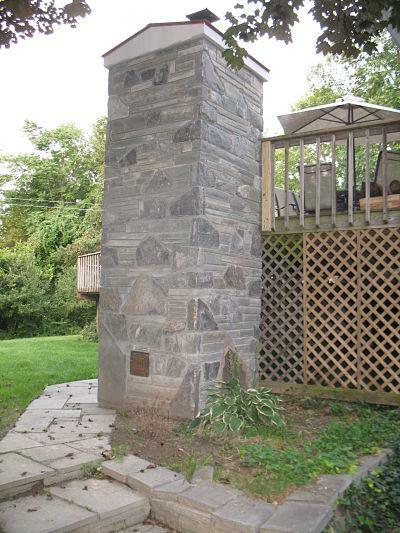 This entry was posted in Stonework and tagged Fireplaces, Masonry Pizza Oven, New York. Bookmark the permalink.